Had I never been to Switzerland, I would have assumed the Epcot team came to Whitney Street. 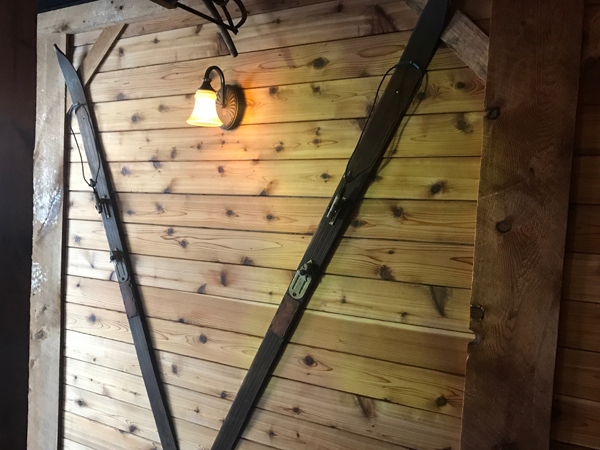 Au Chalet, clad in pine from the bar to the tables, to those sweet Tyrolean chairs with a carved heart on the back, transports you to a quintessential alpine village pub, complete with cuckoo clock. It’s the real deal. 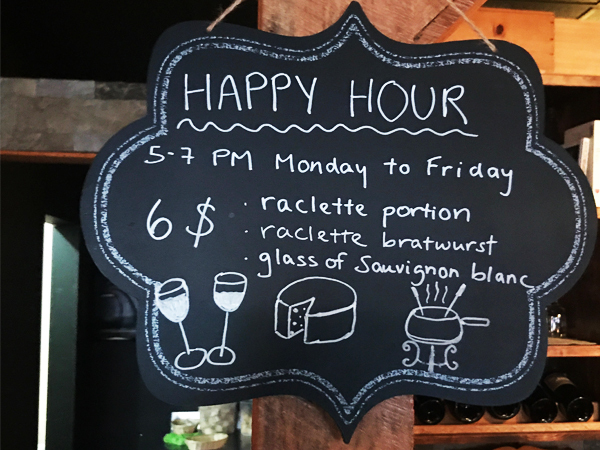 The place is small, and so is the menu: hot raclette offered with or without charcuterie, and fondue with a few additions like herbs, porcini, and champagne, are the main events. 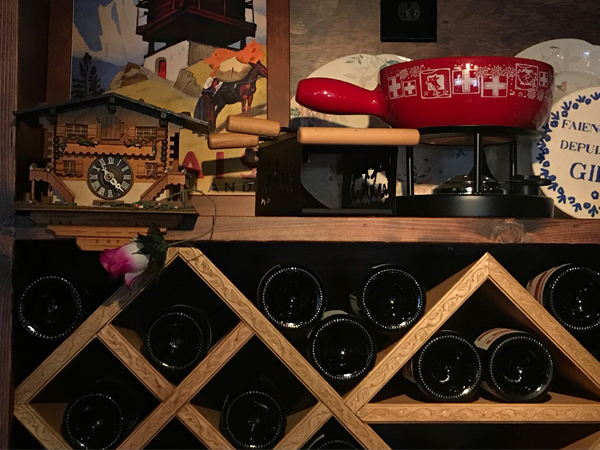 Wines from Les Quatres Vallees region in Switzerland are featured, along with several beer offerings. My first visit, I ordered the classic Croute de Gruyere and my partner had the Raclette with bratwurst. 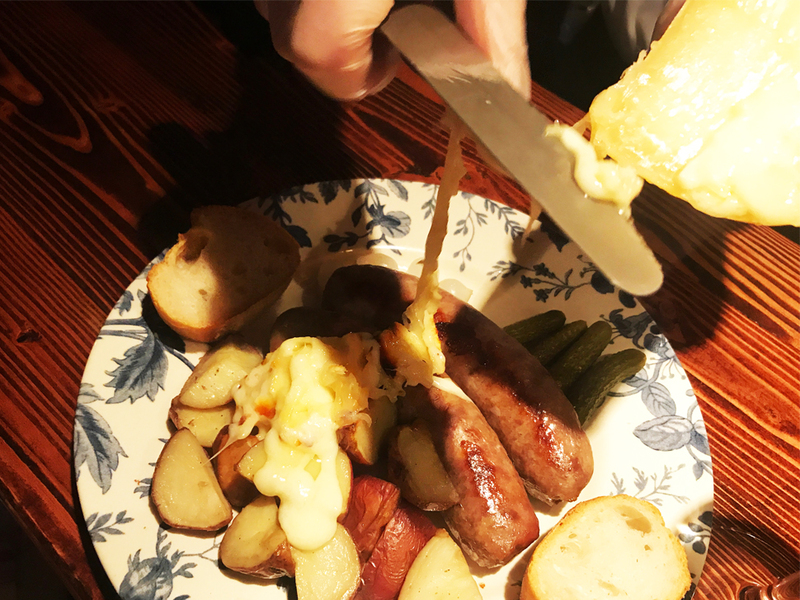 A mouthful of sausage, fingerling potatoes, cornichons, brined pearl onions covered in bubbling cheese is a creamy/salty/savory/crunchy guilty pleasure. Mid-meal, the waiter, came by and scraped a little more raclette on his plate. Heaven. 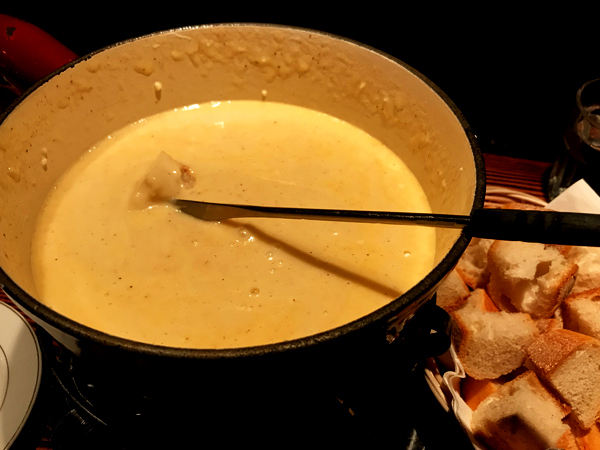 My fondue – I mean, what can I say – chunks of french bread dipped in gooey gruyere? There’s nothing better on a chilly day. However, five dips in, I had an overwhelming need for a respite. The Salad Au Chalet: arugula, strawberries, and walnuts dressed with a tasty honey vinaigrette took the edge off my fromage overdose. I love this place for not being all things to all people. They have taken two dishes that have survived the ups and downs of foodie trends, think Peach Melba and Oysters Rockefeller, knowing a classic done right, can’t fail. And Elm City is glad they did. There is absolutely no other place I’d rather be on a cold and wintry day. It’s got me praying for snow. Bricco, West Hartford Cozy & Yummy Winter Treats Cafe Flo Fondue!